On 14th March 2018, WWE aired its 291st episode of NXT, filmed at Center Stage, Atlanta, GA on 2nd February. Our main event was an NXT Championship match contract signing for the WrestleMania weekend rematch of Aleister Black & Andrade Almas. The card also featured Adam Cole challenging for Pete Dunne's UK Championship, two first-round matches in the Dusty Rhodes Tag Team Classic and MYC competitors, Dakota Kai and Lacey Evans, in competition. But was it any good? Quick squash m8. This wasn't so much a match as it was a continued set-up for the slow dissipation of the Tino-Riddick partnership as Riddick blames Tino for being the one who has taken the pin in consecutive matches but Tino blames Riddick for a miscommunication leading to him getting punched in the head. Still, the right team won and whether it's Lorcan & Burch or Moustache Mountain (or another team as Tyler Bate is currently injured), it seems we're going to be getting a good second round match. Tommaso Ciampa came down to the ring again, this time crutchless, to a chorus of boos and a spread of Johnny Wrestling signs so uniform they could only have been handed out by the production crew. The crowd chant at him for so long, he can't be bothered to talk to them again. To be honest, I can't blame him. Is it bad I want Ciampa to just Air Raid Crash everyone in the crowd? Quicker squash m8. Early on Evans went for the previously injured (by Shayna Baszler) arm of Kai but very quickly, Kai was able to reverse an armbar attempt into a quick roll-up. This was more a set-up for the post-match shenanigans but it's nice to see Kai getting put into the mix as she's one of the more underrated talents to come from the Mae Young Classic. Post-match, Shayna Baszler music hits as she came down to the ring and backed Kai menacingly into the corner, till Moon came down to the ring as well. She told Baszler that if she wanted to do this one more time, they could finish it at New Orleans. Moon then attacked Baszler as the two brawled around the ring. Eventually Moon went to the top but Baszler hit her with a boot to the head and tried to work the arms till Kai came back with a kick off the apron allowing Moon to hit a one-armed Eclipse on Baszler and stand tall. It's official, New Orleans will see Moon v Baszler III. It's been a while but since his Extreme Rules match with Aleister Black, Cole seems to have finally worked out how to make his style work in WWE. 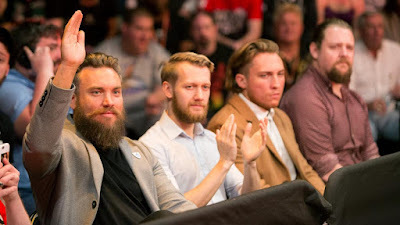 This was an interesting match as Dunne was clearly positioned as the de-facto face but being a dickhead at heart, he still never played it as a good person, just someone who is quite as happy to beat up three men as one. They worked a good back-and-forth match, throwing in some fine near falls including a Last Shot by Cole that was so close, I thought he might be about to take it for a second. Even though he let Cole take the heat in the match, Dunne still approached the match from his normal clinical, brutal style, attacking the fingers and continually trying to stomp out his arms. Of course, with the tag champs on the outside, this was never going to be a clean fight and Dunne tried to fight Fish and O'Reily on the outside to neutralise their threat, but as Dunne was about to hit a Bitter End, in they came and kicked the heck out of Dunne for a DQ victory. I don't think the finish hurt the match as even with the near falls, it didn't seem like a title change was likely on TV and it keeps Cole from taking another pin which keeps him looking strong. It wasn't the best defence Dunne has had but with the ridiculously high level of quality he's maintained, even that isn't a notch against this. Oh, and Adam Cole kicked Dunne in the head while Dunne was backflipping off the ringpost which was dope. Post-Match: Dunne tries to fight off the Era but the number's game is too much for him, Roderick Strong comes down for an assist but is also beat down, before Cole can take Strong's head off, Dunne comes back with a forearm and the two clean house before a show of something approaching respect. What could this mean? Could there be a begrudging partnership forming between the two former foes? Keep watching NXT to find out. So who knew Aleister Black was either an improvisational genius or has spent the last week just writing jokes about Zelina Vega's diminutive stature? Black, dressed in Aleister from head to sockless toes came out first, followed by a lone Vega who proceeded to explain that she was there because this wasn't worth Almas' time before Black proceeded to move the table to the side and Black would go into his Satan's full lotus pose before explaining that now they were on the same level, he could begin. The two went back-and-forth trading insults until Vega gave Black a stinging slap on the cheek. After Black had signed and left the ring, he announced that he was glad she'd come alone because he hadn't and out came Candice LeRae who battered Vega around the ring and back in to hit a tornado bulldog to stand tall, sending us home happy. I love a good contract signing and this one had everything you could want. If Black and Almas can deliver on the build here, we might be in for another classic at TakeOver. Tino and Riddick are still having problems but Moss doesn't want to give up on the good thing they have, whatever that is. They're going to go and review the tapes. It's another edition of Street Talk but this one is neither on the street or involving talking to anyone other than each other. They say they're going to win the Dusty Classic. Don't forget, you've got Authors of Pain in the next round, lads. Another week, another very good episode. Is it too early to declare NXT to be on a new hot streak? I hope not because I think with a great match between Cole and Dunne, some great world-building around it and some hot stuff still to come in the Dusty Classic, this definitely feels like how a hot streak feels.